Corn bulls continue to talk about heavy rains in parts of the Delta, southern Illinois and select areas in Indiana and Missouri. Thoughts are the excessive moisture could continue to keep the combines out of the fields and create more headline talk surrounding early corn quality and deliverability of the bushels. For this reason there's some talk inside the trade that the basis for producers down south and for those feeding into the river system, especially those flowing down into the Gulf, could stay strong for a while longer. Bulls also continue to talk about the recent heavy ear weight estimate released by the USDA. The ear weight number they are using is said to be almost 6% higher than the one used at this time during the record yielding year of 2014. This has many inside the trade thinking the USDA could adjust this number lower in their upcoming report, making this their highest yield estimate of the year. Be careful with this theory. I'm not saying they couldn't adjust the number lower, I'm just not 100% sold on the USDA immediately backpedaling during the next report in September. It might take a bit more time to iron out some of the wrinkles and final uncertainties surrounding the national yield. There are just a ton of moving parts that still need to be considered and digested. 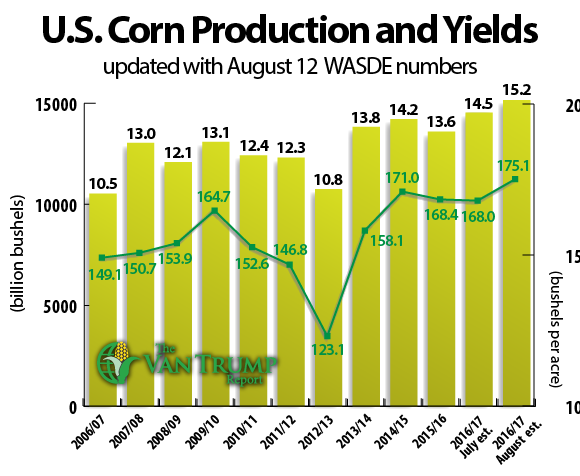 Many analyst are saying if the ear weight is reduced to something like we saw reported back in 2014, which was still a record yielding year, we could quickly trim close to 400 million bushels off the current USDA production forecast. Despite all of the what ifs... As a producer I continue to keep my hedges in place, believing ultimately we could see another leg lower as we move deeper into harvest. From a technical perspective I continue to see more heavy resistance up between the $3.50 and $3.80 areas. I suspect if we get more extreme U.S. rainfall and flooding headlines we could make a run to the upper end of the aforementioned range within the next three or four weeks. On the flip side, if the weather cooperates and some of the key production areas get a clear window to harvest, short-side price pressure could again fall into vogue with bigger investors and large money-managers.